Join the discussion on our forums! Come discuss Druid of the Scythe over in our dedicated Druid of the Scythe discussion topic. Decent card in Spiteful Druid but almost certainly will be one of the first cards in that list to be cut as better minions are printed in the upcoming expansions. It's basically a Shadow Bolt that can't go through taunt. I don't know why you'd ever want to use the taunt mode for. That one is very situational and is probably just worse most of the time. 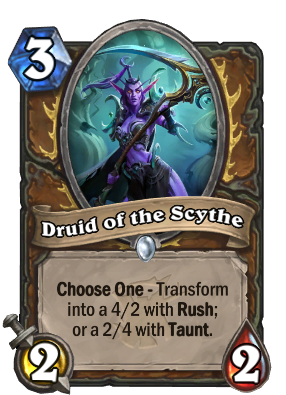 disappointed that she is called "Druid of the Scythe" but she becomes "Druid which doesnt have much to do with a scythe" after the transfromation. if taunt version had bear form it would be nice. Does Countess Ashmore pull this card? 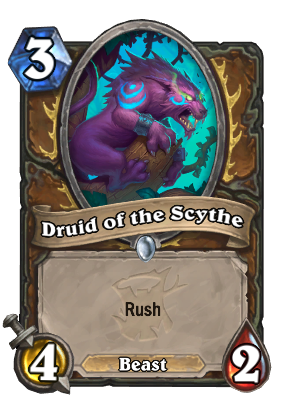 Technically Druid of the Scythe CAN have Rush...so...it should? 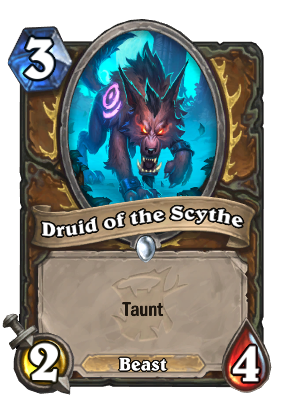 There's a wolf druid form? Good possibility in Aggro Druid as a removal option, protect your other threats. Will have to see if they get some more "buff your board" or "buff a beast" cards to determine what Aggro Druid will look like though. It's a cat form (she has a long thin tail compared to the bushy one of the wolf form). Whats next Blizzard? Gnomes Loli's with scythes? Boring... but usefull I guess. Pretty decent three drop for almost any druid archetype.